It’s been a while since I was here describing photography that sells, but I’m back! If you have heard me talk about real estate, you know I focus on selling listings for top dollar. By owning the marketing agency for over 10 years, I’m sometimes a little over analytical on perfecting listings. Let’s be honest, is that really going to hurt our clients? Exactly! I’d rather perfect it than fall short on getting the job done. 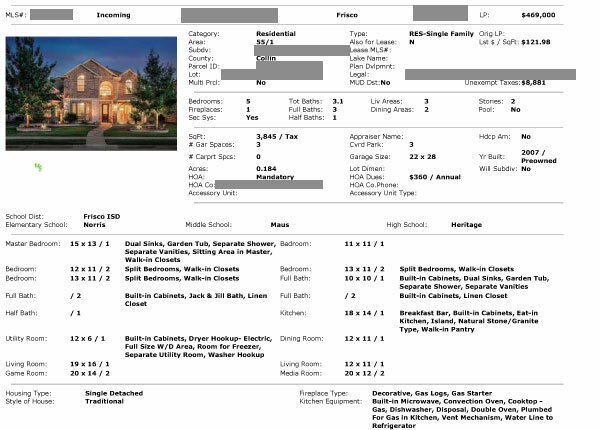 Let’s start with what an MLS sheet looks like when printed out by an agent. Yes, it was fun redacting an MLS printout to hide the home address. An agent is going to show buyers the homes that match their MLS criteria. The bathrooms, bedrooms, garage spaces, year built, school districts, etc. When a buyer sees 10 homes or so in a day, how much of this sheet do you think they remember? First, if it is a no go, it has a big X over the page, or is in the trash can. 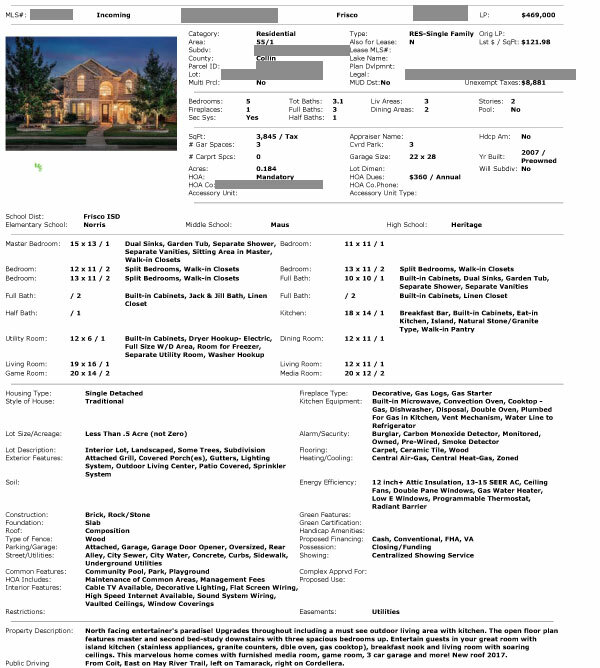 The main parts a buyer sees in their MLS portal and on this MLS sheet when looking at homes is the main photo and the property description. Obviously, I think photos are the number one selling tool for your listing. Number two…sell it with the description! Have you ever seen a marketing flyer for a product have a photo of the product, then describe the looks of the product as their main description of why buy? Nope. The main description in a paragraph or bullets describes why you should buy the product and what it will do to help you or your business. Now, can you tell me why so many property descriptions in MLS describe the looks that you could see directly in the first 3 photos? I can’t either! “Beautiful stone exterior with a winding staircase the moment you open the door.” Wow…you described the photos! Product and brand marketing tells you why you should buy and a house shouldn’t be any different! Sell them! Sell that buyer into buying YOUR house, and they can’t think about anything else because you perfectly described their needs versus the looks. Hire yourself a Realtor that describes the buyer need for your home versus the one that tells you how pretty it is. We all like pretty things, but what are the buyer needs? Our local market has a need for North and East facing homes that fit a certain feng shui need for many buyers. We don’t have an MLS box that narrows direction of home, so I’m going to list it first if it hits a buyer need. This price range, many buyers are entertainers. What do they need the home for? Entertaining. Entertainers love the outdoor living area. The outdoor living area is also very seldom found through MLS criteria, which is why it’s next. Many descriptions go from front of home to back, and this would have barely been mentioned. I go from most important need to least important buyer need. This description sells the home, not describes it. It hits on the emotions of the buyers that say “I want this home and can’t live without it.” They feel like they already live there. One of the agents that submitted an offer for a client told me they wanted it before they ever walked in the door. If you are an agent, ask yourself why a buyer would buy the home on features other than looks. If you are a seller, read through your description and ask yourself if it describes your home, or sells it! Why did you buy your home? What do you do in it? That’s how you sell it to the next buyer! If you are planning on listing for top dollar around north DFW, give me a shout and I’ll over analyze your home in a listing presentation and you can decide if I succeeded! Challenge accepted!